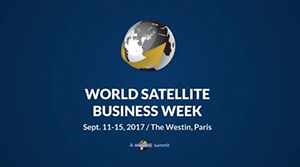 ILS is excited to be back in Paris again this year for World Satellite Business Week (WSBW) on September 10-13. WSBW is a unique executive meeting place for leaders in the global satellite communications and information business industry. ILS President Kirk Pysher will be a speaker at the 22nd Summit for Satellite Financing on September 11. The topic, “Accelerating Access to Space”, will discuss current performance and priorities of launch service companies, the status of development programs for next generation launchers, and specific challenges that launch companies will be facing such as delivery of constellation programs adapting to changes in demand patterns. Be sure to visit the ILS web site at ilslaunch.com for the latest news and updates on the conference.